We are one of the leading processors of Gujarati Cuisine. 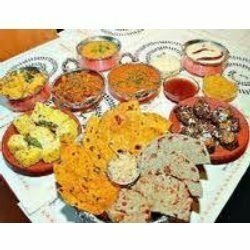 Our Gujarati Cuisine includes dal, bhaat (rice), vegetables, chapatis, kachumbar (mixed vegetables salad), papad and curd. Our food range is valued for their nourishing and balanced compositions of the ingredients. Further, our range comprises Snacks like dhokla, khandvi, sweets like basundi.